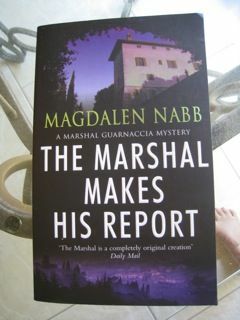 The Little House of Concrete Bookshelves: Magdalen Nabb "The Marshal Makes His Report"
One of the advantages of the exotic setting for crime fiction is the opportunity such locations provide to add local colour, tradition and customs to the more straightforward whodunnit? aspects of the investigation. That's not to suggest that the whodunnit? side of things is going to be straightforward. Oh, yeah, I knew that's the way is was from the start doesn't make for an interesting reading experience unless the author's managed to throw in a couple of substantial distractions along the way, but if you knew it from the start that probably means the distractions and false trails could have been done better. Magdalen Nabb's The Marshal Makes His Report is set, as usual, in Florence (I'd call it Firenze if she did) and this time around we get the local colour side of things with the city's medieval football tournament, which weaves its way through the investigation of a death that everyone involved wants to be an accident even though suicide would appear to be the more likely scenario. Suicide would have important implications for the deceased's insurance policy, so while Marshall Guarnaccia is assigned to report on the death, he's working within fairly obvious investigative constraints. The setting for the death itself, a palazzo whose owners have fallen on straitened financial times and have been forced to subdivide and lease out a large part of the property, provides plenty of suspicious circumstances that need to be looked into while the Marshal is poking around the possible crime scene. Start with the just-widowed aristocrat whose pretensions to continued grandeur aren't quite matched by her financial circumstances, a sickly son who has issues of his own, and a couple of retainers who add their own complications to matters and place them in a building with concealed doorways and passages that allow for plenty of surreptitious scampering and furtive eavesdropping. For extra complications throw in the tenants, including a female doctor whose living quarters and surgery are probably a major source of rental income but has issues of her own with her landlady, an artist, a ballet school and an English girl who's absent throughout proceedings but is a key element in the solution and there's plenty of intrigue before Guarnaccia steps outside the building in the course of his investigations. An interesting read that didn't resolve things till right at the end, and while the Marshal does, finally, make his report, the report he makes isn't quite the one he started on. I'll be looking for the rest of the series though it's not, at this stage, one that needs to be read in sequence.